Okay, so you are building a website. Or maybe you are reworking an existing site. With all the talk about optimizing for search engines, and for fast loading or any number of other ways that are viewed by designers as vital that sometimes we forget about all the people that will visit the site and what their experience will be like. Here are 4 ways to optimize your website that are vital to the experience of those visitors and therefore to the success of your website and/or business. While SEO and Social Media both play a part in this, it’s most important that you get a feel for how your website visitors think when they are looking for the content you will be providing on your site. Are they looking for solutions, or simply news? Do your titles, categories and navigation items reflect the expectations you would have if it were you searching for this content? Optimizing for discovery also means doing all the technical things for SEO that emphasis keywords, but select keywords with your visitors in mind. It also means making it as easy as possible to share the content on Social Media and to follow you too! This makes discovery by future visitors easier, as well as return visits more likely. Provide your content in the formats your visitors want to use. Seems logical, no?! Yes, video is always good but don’t neglect images! They remain the most shared media of all, including video. Layout, content and delivery method should all be structured with an eye toward keeping visitors on the site. These should all eventually have an end goal off obtaining an opt-in or making a sale. Content that is connected AND makes reference to other content on the website is not just engaging, it also makes Google happy. And btw, making Google happy is pretty much always a good idea! Don’t be even subconsciously nervous about making strong calls to action on your website. Transparency is expected by today’s website visitors. They also expect you to make an offer of business either directly on the site, or in follow up communication like email newsletters or however else you provide follow up information. These 4 aspects of website optimization should also be thought of in terms of how they affect each other to get the most from every visitor. Visitors get you more visitors, and the longer they stay on your site the more return visits they make as well. Remember that Discovery is a product of Engaging content that is eagerly Consumed leading to increased Conversions. The interrelationship between these is endless. 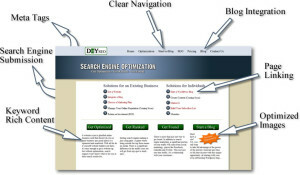 Optimizing your website with these things in mind will pay big dividends. Click the button at the right for a Free Strategy Session and let us show you how to apply this to your own website.